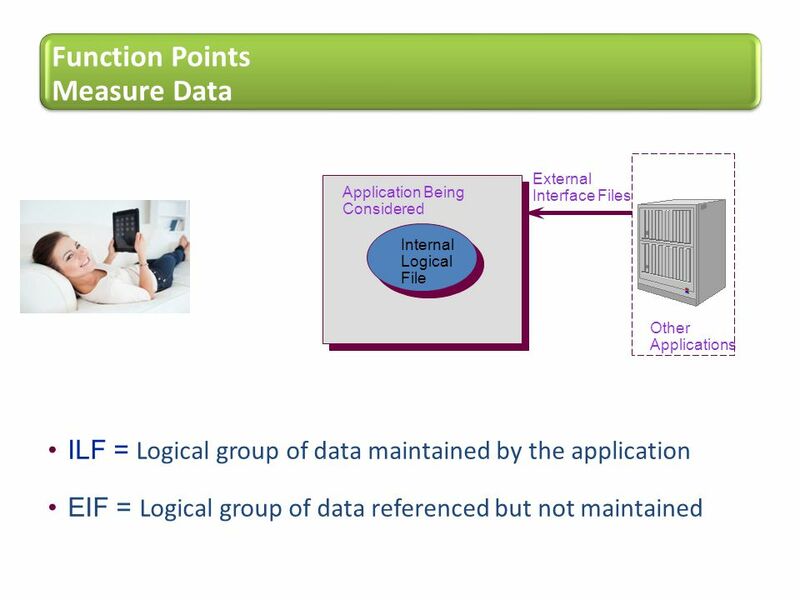 3 Why are they important to software measurement? 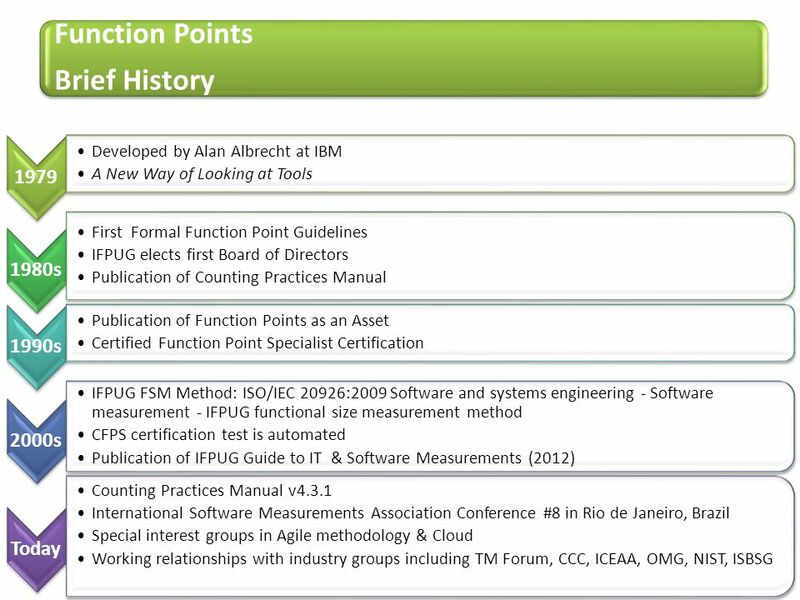 Function Points Brief History What they are? How are they used? 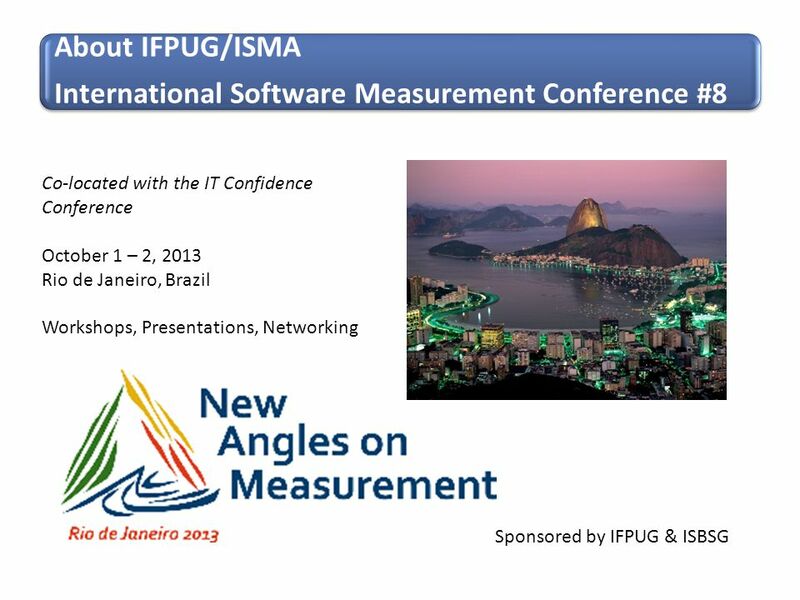 Why are they important to software measurement? 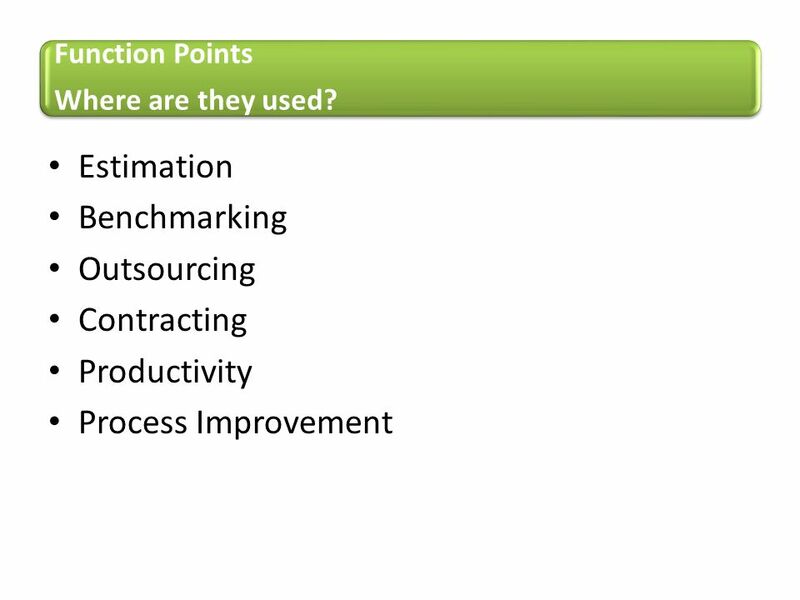 5 Function Points What are they? 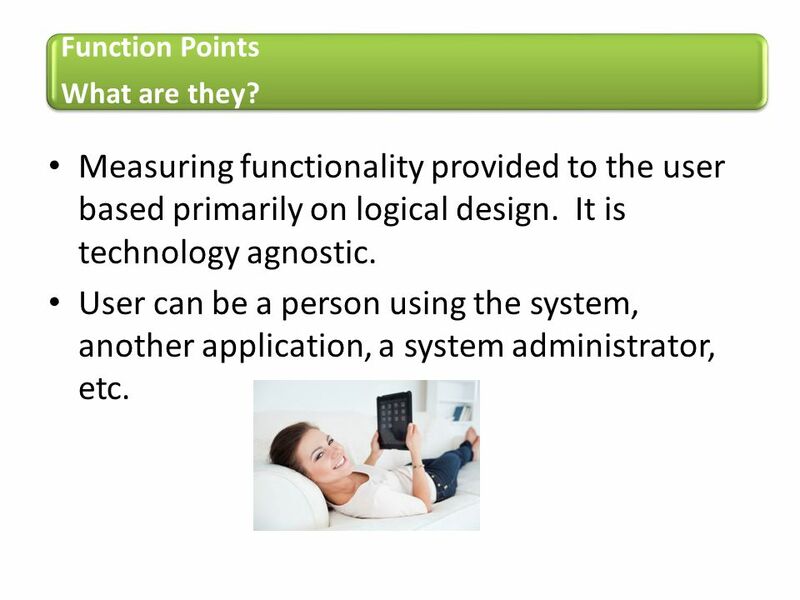 Measuring functionality provided to the user based primarily on logical design. It is technology agnostic. User can be a person using the system, another application, a system administrator, etc. 14 Why are they important to software measurement? 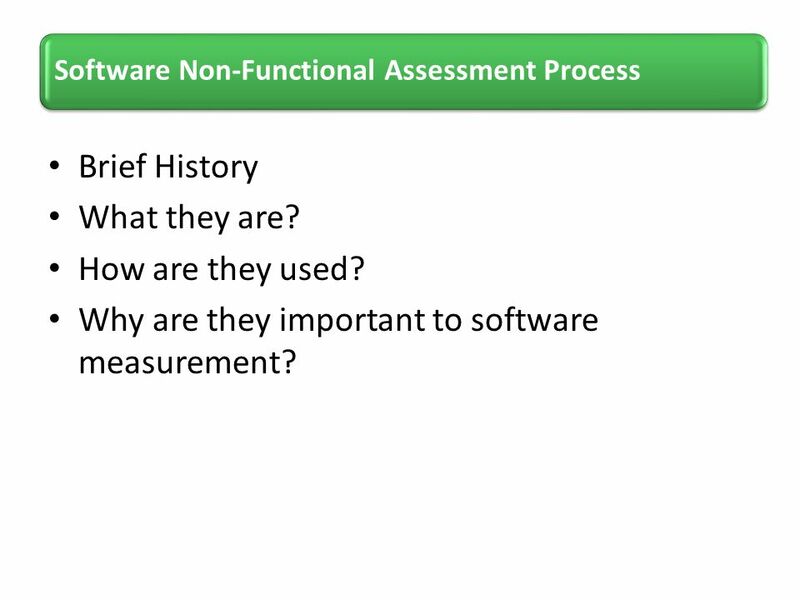 Software Non-Functional Assessment Process Brief History What they are? How are they used? 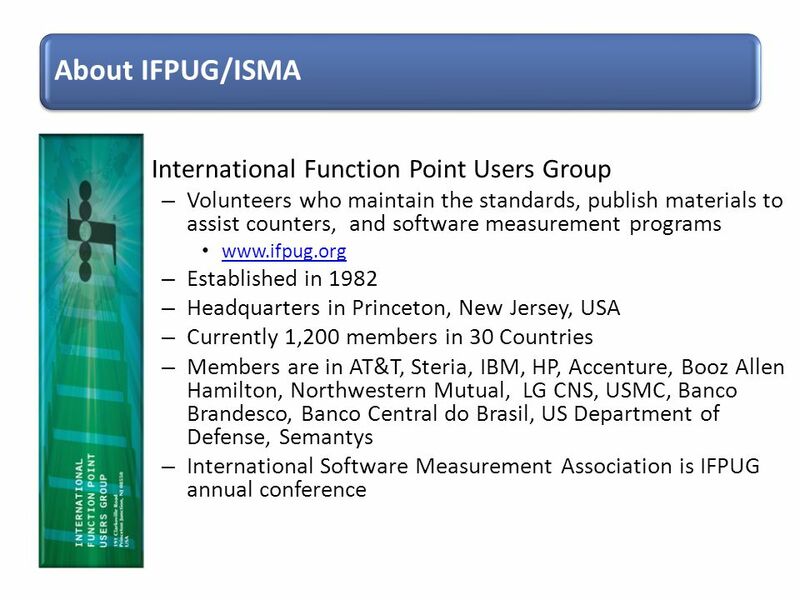 Why are they important to software measurement? 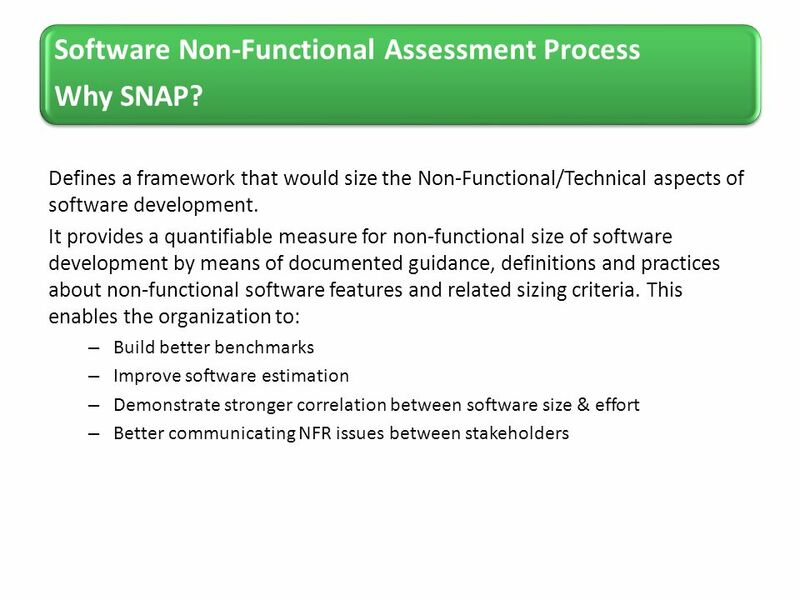 16 Software Non-Functional Assessment Process Why SNAP? 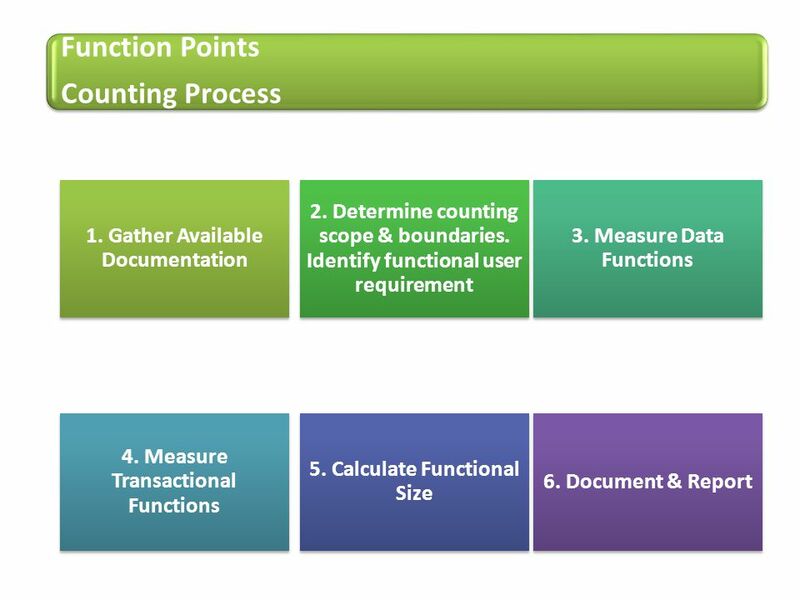 For each non-functional requirement, it is possible to determine the non-functional size in three steps 1. 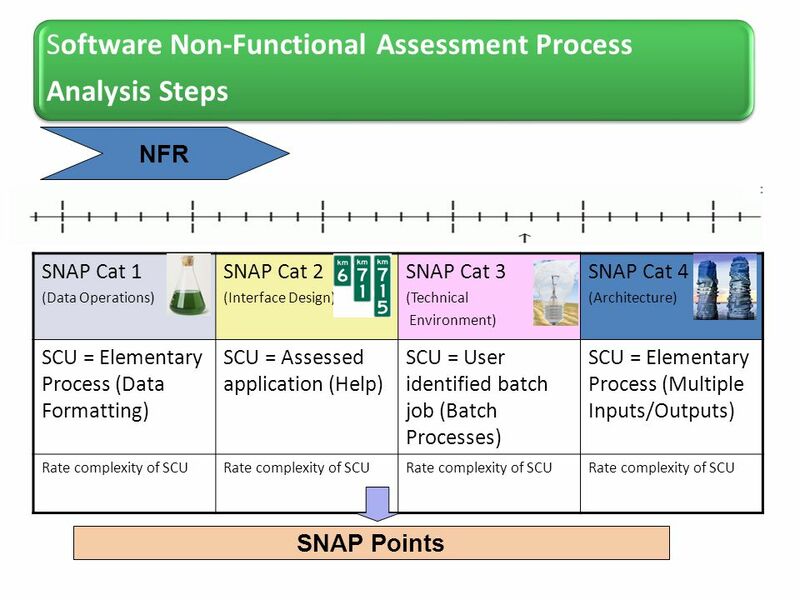 Identify the Snap Counting Unit (SCU). 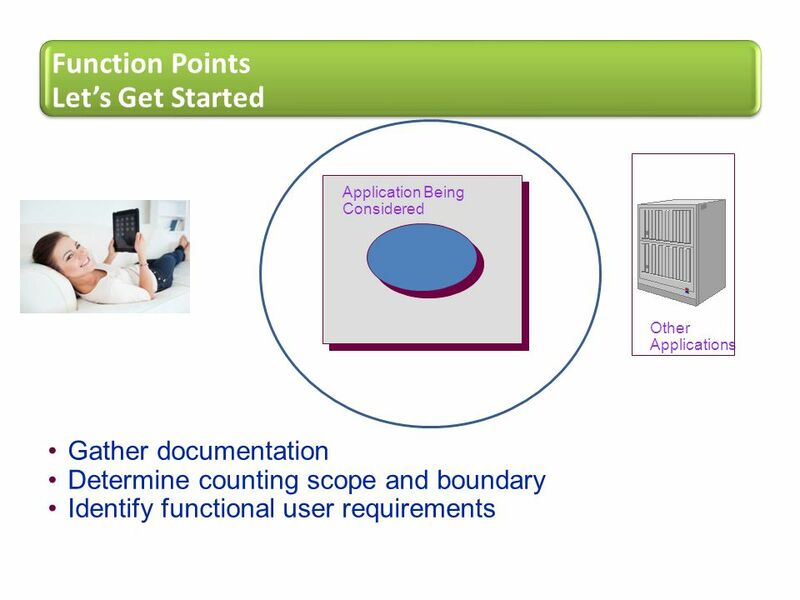 This is the unit of measurement for the sub-category such as elementary process, assessed application, user identified batch job. 2. 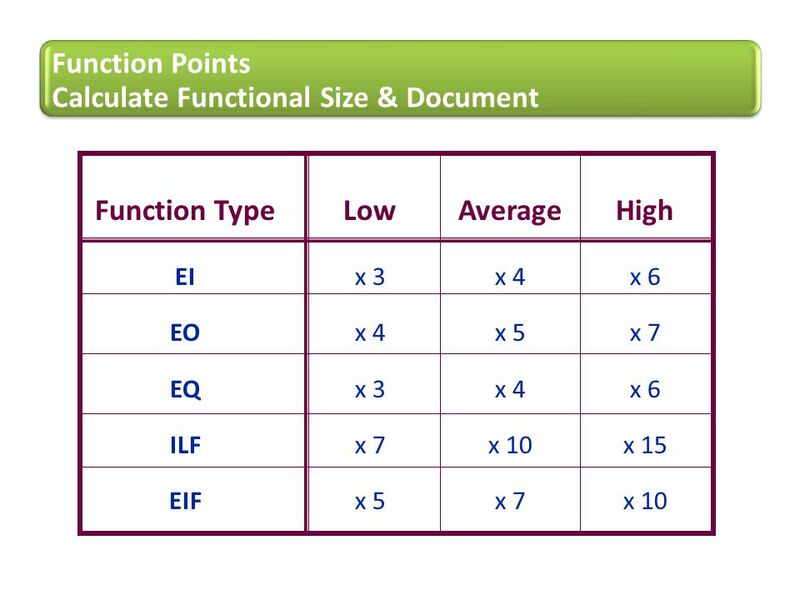 Determine the non-functional size (SP) for each SCU within the sub category, by using the equations or the tables for the sub-categories 3. 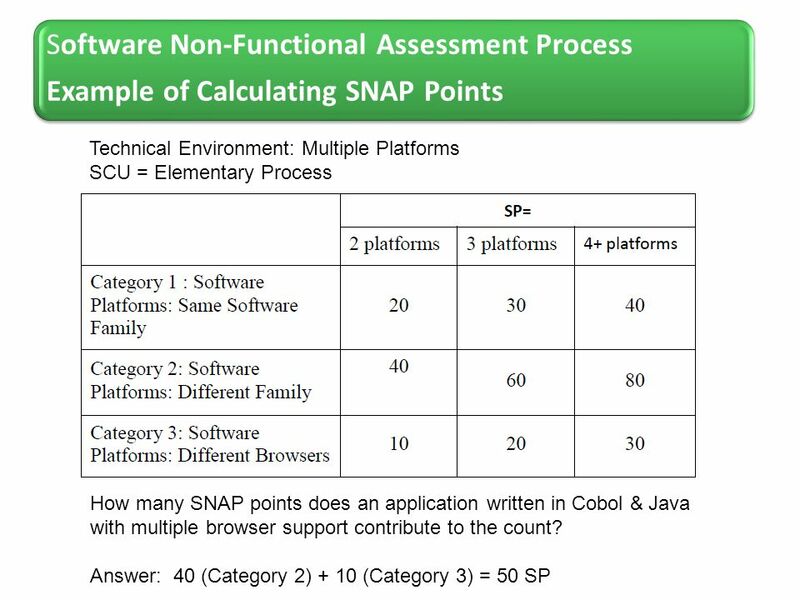 Determine the SP for a specific project or application by using the formula for the project type in question The SCU is a component or activity, in which complexity and size is assessed. 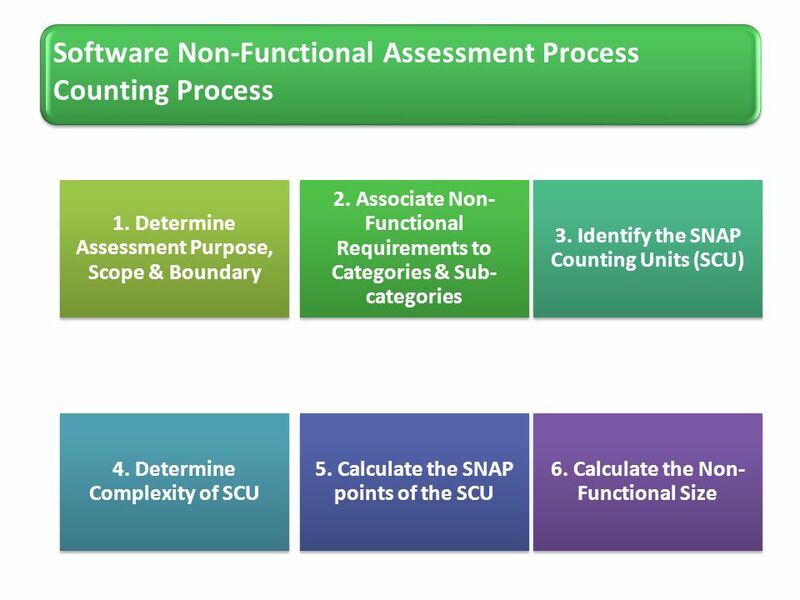 The SCU can be a component, a process or an activity identified according to the nature of the sub-category/sub-categories. 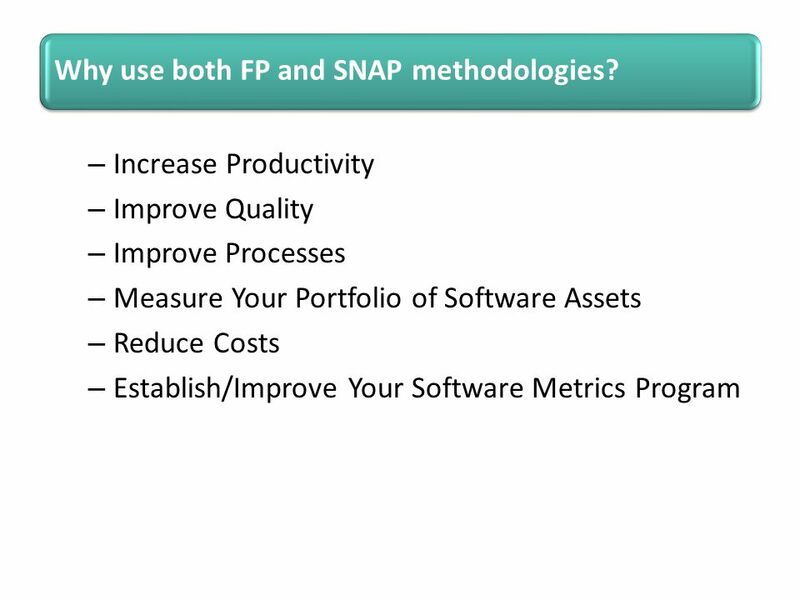 22 Why use both FP and SNAP methodologies? 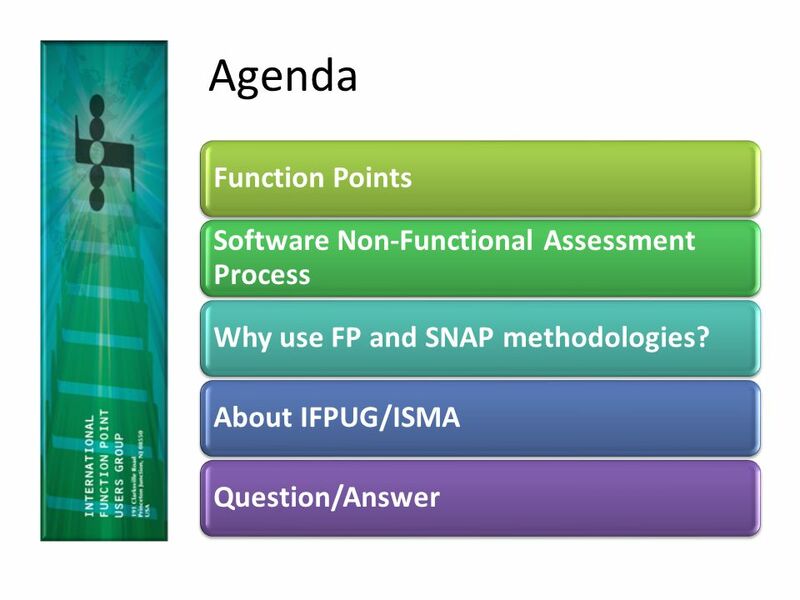 23 Why use both FP and SNAP methodologies? 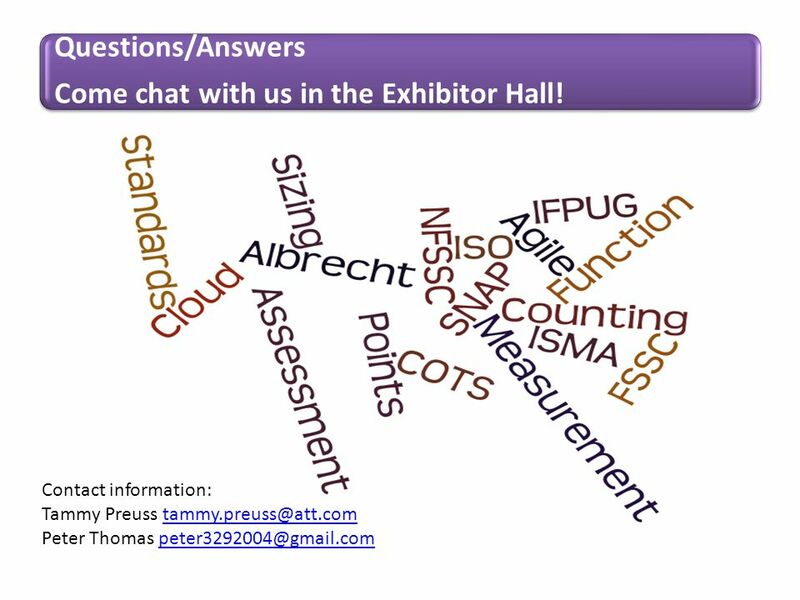 27 Come chat with us in the Exhibitor Hall! 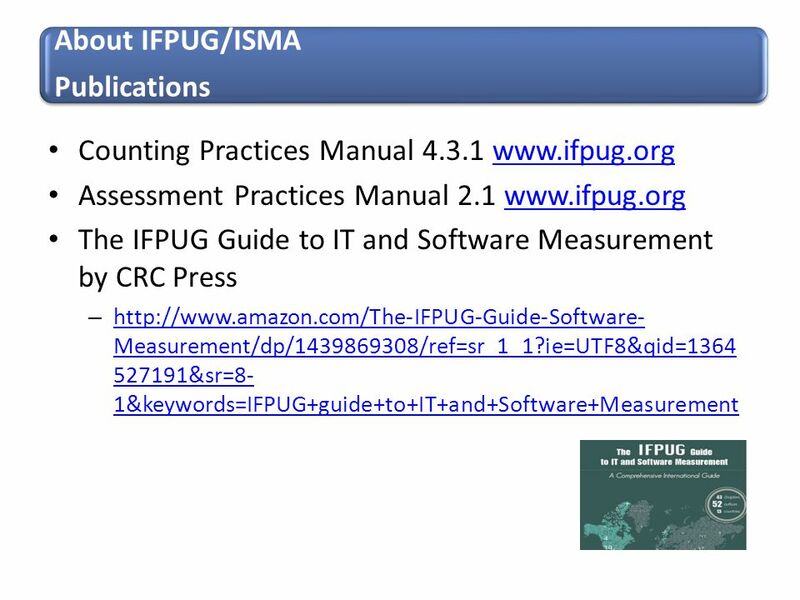 Download ppt "International Function Point Users Group"
FPA – IFPUG CPM 4.1 Rules. 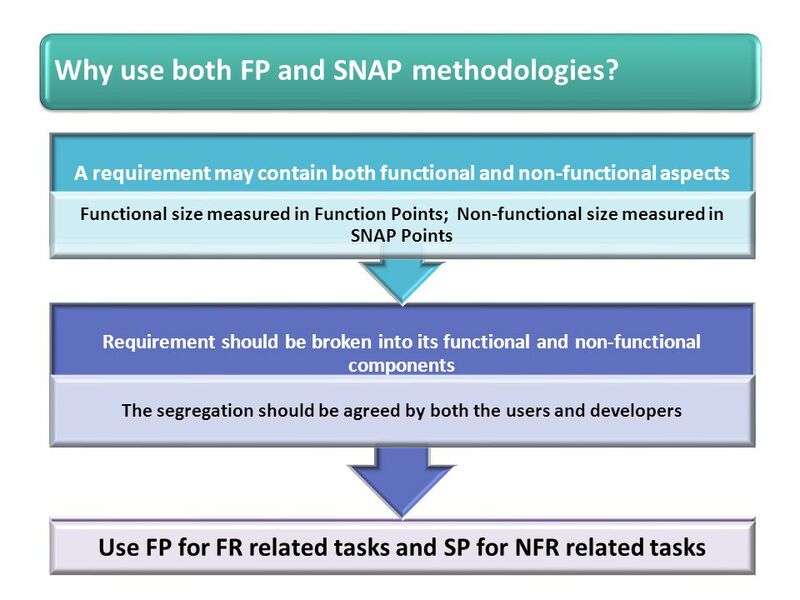 StratusLab is co-funded by the European Community’s Seventh Framework Programme (Capacities) Grant Agreement INFSO-RI Work Package 4 Software Integration. Software Engineering Institute Carnegie Mellon University Pittsburgh, PA Sponsored by the U.S. Department of Defense © 1998 by Carnegie Mellon. 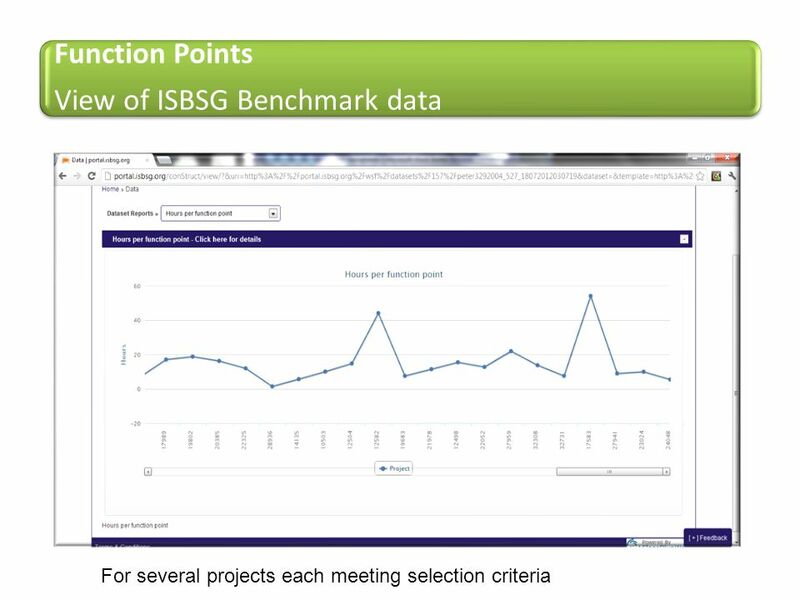 Software Effort Estimation based on Use Case Points Chandrika Seenappa 30 th March 2015 Professor: Hossein Saiedian. 1 Calibrating Function Points Using Neuro-Fuzzy Technique Vivian Xia NFA Estimation Inc. London, Ontario, Canada Danny Ho IT Department. 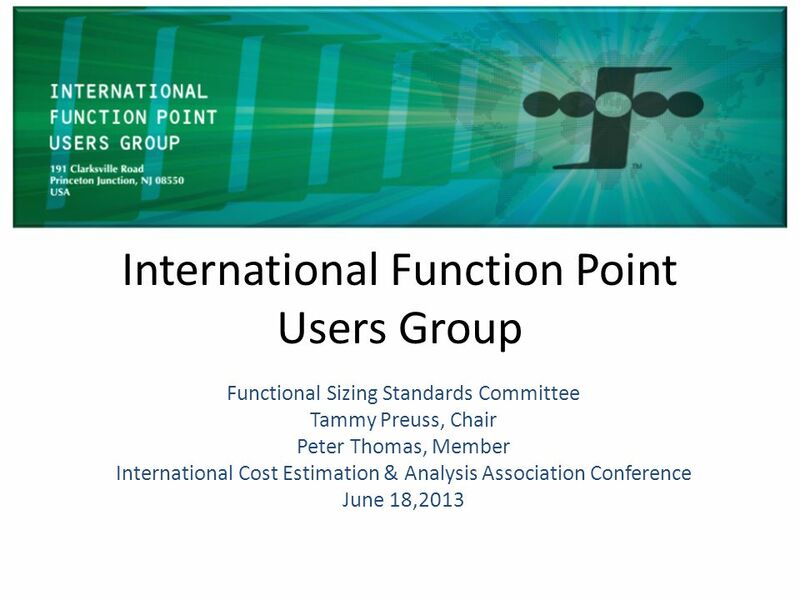 1 PROJECT SIZING AND ESTIMATING - EFFECTIVELY USING FUNCTIONAL MEASUREMENT Southern California Software Process Improvement. Security Engineering II. Problem Sources 1.Requirements definitions, omissions, and mistakes 2.System design flaws 3.Hardware implementation flaws, such. CASE Tools CIS 376 Bruce R. Maxim UM-Dearborn. 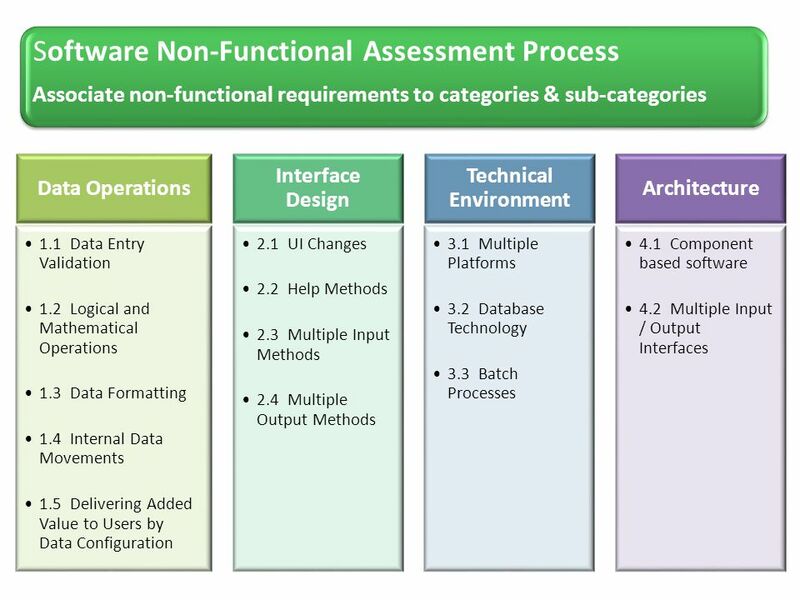 Prerequisites to Software Tool Use Collection of useful tools that help in every step of building a product. Information Systems Development and Acquisition Chapter 8 Jessup & Valacich Instructor: Ramesh Sankaranarayanan. 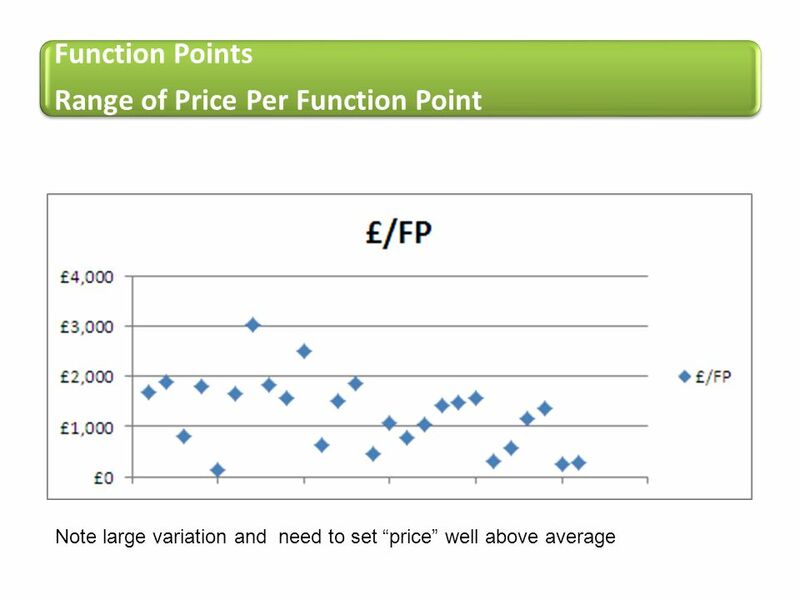 SOFTWARE PROJECT MANAGEMENT AND COST ESTIMATION © University of LiverpoolCOMP 319slide 1. Procurement From the 20 th to the 21 st Century Copyright Byron Honoré This work is the intellectual property of the author. Permission is granted. 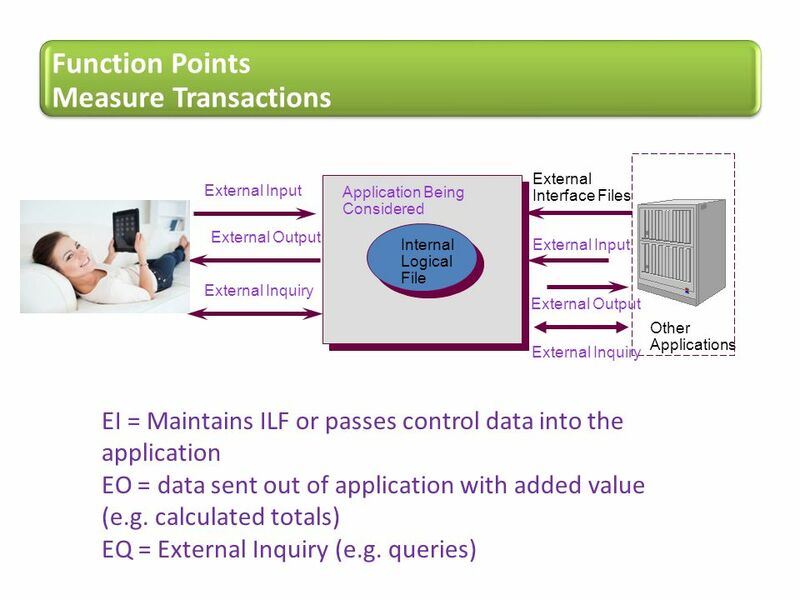 The Art and Science of Estimating Software Development Cost Glenn Briskin Partner, Sierra Systems Group A. Nicklas Malik Technical Architect Certified.